DMC was founded in 2006 with one singular goal: To encourage Odd Fellows membership growth. We have focused on this goal with laser-like dedication year after year, month after month, week after week, and day after day. And the reason is simple. 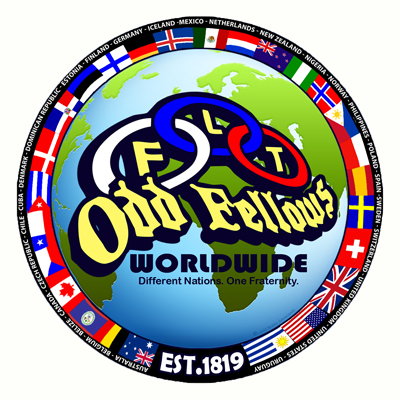 Odd Fellowship has been on a steady decline in membership for the past three generations. Unless we stop, and then reverse, this free-fall, the Order will be diminished and may very well pass away into the annals of fraternal history. Every true Odd Fellow who cares about our three-links fraternity should heartily applaud and support this goal. One of the methods by which DMC fosters the goal of membership growth is that we, from time to time, offer helpful suggestions to help your Lodge grow. This newsletter will continue the effort, and will focus on challenges faced by the very small Lodge – that is, the Lodge of 6-12 members. These very small Lodges often have great difficulty even maintaining a bare quorum so that they can have a meeting. If you are a Noble Grand, or a Vice Grand, or a member of such a very small Lodge, this newsletter is directed to YOU. Is your very small Lodge destined to die? Inevitably, yes, if you make no effort to save it. Eventually, the very small Lodge will diminish and will literally expire (e.g. surrender the charter or seek to consolidate) as your older members move away or pass away. This scenario, however, is not inevitable for members who make the effort to change the trajectory. Is it worth the effort? Certainly. If your Lodge has been in existence for a century or more, shame on you if you let it die during your watch. So what can the very small Lodge do to increase membership and revitalize the Lodge? 1. The Retreat. The first step in the process of revitalizing the very small Lodge is to talk about it. After all, declining membership has to be the elephant sitting in the middle of your Lodge room. You can step around the elephant and choose to ignore it, or you can recognize that you have a pachyderm in your midst and deal with it. In this regard, you need to convene a meeting of the Lodge (call it a Lodge Retreat if you will), solely dedicated to one topic: Membership. Have a frank discussion about the topic and see if you can move to point two of the revitalization plan. 2. The Commitment. Membership development is not accomplished by Sovereign Grand Lodge, nor by Grand Lodge, nor even by your Lodge. Only members of the Lodge can ultimately bring in new members. It is a task for each member, not just one or two. Imagine, in the very small Lodge if each member brought in just one new member – the Lodge would double in size. Now, you may find that the members of your Lodge are too tired, too lazy, too old, or too complacent to care about bringing in new blood (in fact, you may find that some members actually don’t want new members, because new members might change the status quo to which they have become accustomed). If that is the consensus of your Lodge, then (to be completely frank) your Lodge is just a zombie Lodge, going through the motions, but not the spirit of a fraternity. It is destined to diminish and perish. On the other hand, if at least a majority of the members are ready to grow and save the Lodge, then there is hope for your Lodge’s future. Get the commitment from the membership to move on to point three of the revitalization plan. 3. The Ask. So, what can the very small Lodge do to change the trajectory? Plenty Unless you are a member of a Lodge of hermits and recluses, then it’s fair to say that everyone knows someone. It could be a wife or husband, a son or a daughter, a grandson or granddaughter, bothers and sisters, nieces and nephews – just to mention family members. Then there are the business people you know, colleagues at work or in the retirement community, town leaders, members of your church or temple, your barber or hairdresser, doctor, lawyer, chiropractor, etc. Every member of the Lodge should identify at least three people to whom the will talk about the Lodge and whom they will actually ask to consider joining the Lodge. But a word of caution: point three of the plan won’t work unless point four is in place. 4. The Reveal. OK. 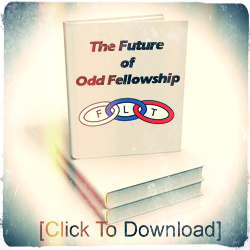 So, you have talked to Fred and Mary about your Lodge and about Odd Fellowship, and they have expressed some interest. That is a huge step forward. But, all this effort will be for nothing unless you can present something that will capture Fred and Mary’s interest. Let me let you in on a little secret. No one will join your Lodge if all you do is read from the ritual book and have nifty passwords and signs. When you finally “reveal” your Lodge to the new prospect, what can you show them? Does your Lodge have a community project? 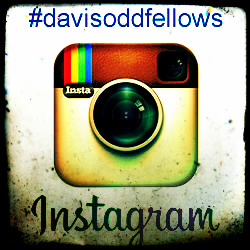 Does your Lodge have some enjoyable social events for the members? Without the ability to do good works in the community and without a fun social aspect – there is, frankly, little that Lodge membership can offer. Even the smallest Lodge can have one community project. Even the smallest Lodge can plan and schedule fun and meaningful social events for members and family. 5. The Next Generation. Any revitalization plan – even for the very small Lodge – must focus not only on the present, but also on the future. If, for example. the membership of the Lodge are all in their 60’s, 70’s and 80’s, it makes little sense to bring in new members in their 60’s, 70’s and 80’s. Nothing wrong with that generation, of course. However, if all the new members brought into the Lodge are, essentially, the same age as existing members, your Lodge is doomed to failure. In 10 years, the membership of the Lodge will be a bit larger, but it will be a group in their 70’s, 80’s and 90’s. While you bring in members of your own age and generation, it is imperative that you also bring in younger members of the next generation.